OAK RIDGE, Tenn., Feb. 9, 2017 - Four technologies developed at the Department of Energy's Oak Ridge National Laboratory have earned Federal Laboratory Consortium awards for excellence in technology transfer. The FLC is a network of more than 300 federal laboratories, facilities and research centers dedicated to promoting and strengthening the commercialization of federal laboratory-developed technologies and expertise. The honors place ORNL in elite company, according to Donna Bialozor, FLC Awards committee chair, who wrote: "This year your laboratory is one of a select number of recipients, an indication that your nominations were truly of the highest caliber." Mike Paulus, ORNL's director of technology transfer, noted that it is especially significant that ORNL won four of the 19 FLC awards for excellence in technology transfer. "With these latest awards, ORNL has now won 55 since 1986, reaffirming the importance and relevance of our research and development." Piranha Text Mining Tool, licensed to Vortex Analytics. Piranha, the recipient of an R&D 100 Award in 2007, is an agent-based technology to analyze text data with unprecedented speed and accuracy. The software suite enables the evaluation of large volumes of unstructured text-based data across many different formats cost effectively and efficiently. The software provides unparalleled processing speeds and is ideal for data mining applications in any situation in which large amounts of text-based data must be analyzed quickly and effectively. Prior to the technology transfer effort that is the subject of this honor, ORNL researchers used the technology in their work with the FBI to mine large amounts of text-based data. Piranha was invented by Thomas Potok, Robert Patton and James Treadwell of ORNL. Others named on the award were David Sims, Marc Filigenzi and Barry Goss. Open Port Sampling Interfaces for Mass Spectrometry, licensed by SCIEX. This innovation dramatically simplifies mass spectrometry, enabling its wider use. Scientists use mass spectrometry to perform chemical analysis with high selectivity and sensitivity, detecting and differentiating millions of chemicals in quantities down to 1 part per billion. The simplicity of the device allows even novices with the means to introduce unprocessed solid or liquid samples into a mass spectrometer without fear of instrument contamination. To identify a compound, researchers simply touch the object of interest to the solvent dome at the sampling end of the probe, which is connected to a mass spectrometer. Almost instantaneously, a screen displays data that identifies the chemical and its approximate concentration. Because this approach requires no sample preparation and the device is self-cleaning, the system is especially attractive for a wide range of applications. The Open Port Sampling Interfaces for Mass Spectrometry technology was invented by Gary Van Berkel and Vilmos Kertesz of ORNL and Tom Covey and Kevin Smith of SCIEX. Also named on the award were Jennifer Caldwell, Edna Gergel and Marc Filligenzi of ORNL. Superhydrophobic Transparent Glass Thin Film Innovation, licensed to Samsung. This transparent glass thin film coating provides glass displays that are extremely water repellant, durable and fingerprint-proof for products such as smart phones and tablets, solar panels, optical components and windows. Unlike more fragile polymeric and powder-based options, this coating exhibits superior resistance to abrasion and is thermally stable to 500 degrees Celsius. The coating uses non-toxic naturally abundant and inexpensive precursor materials. The superhydrophobic coating was invented by ORNL's Tolga Aytug and John Simpson, formerly of ORNL. Also named on the award were Eugene Cochran and Marc Filligenzi of ORNL and Yoon Goo Lee and Debasis Bera of Samsung. Miniature Ion Trap Mass Analyzer, licensed by 908 Devices. 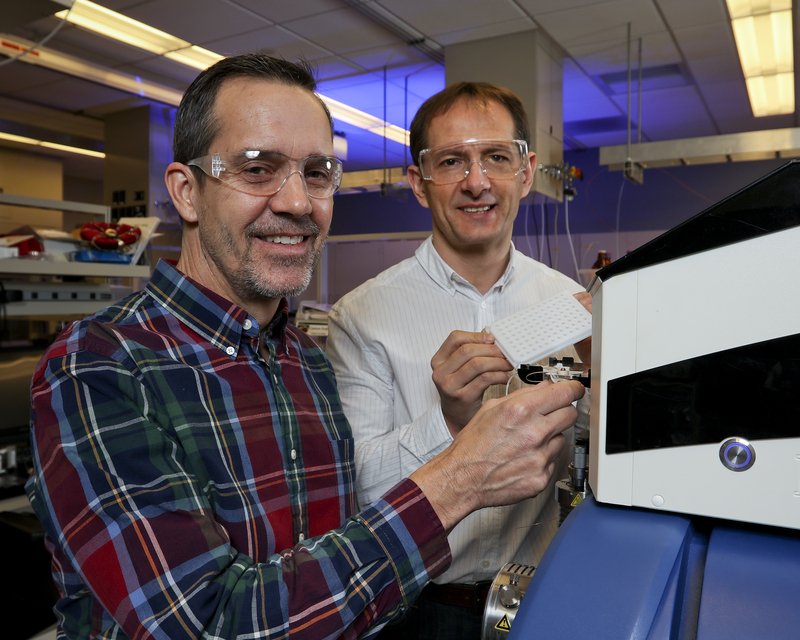 This ORNL technology takes mass spectrometry to a new level, making it elegantly simple, easy to use and more affordable. 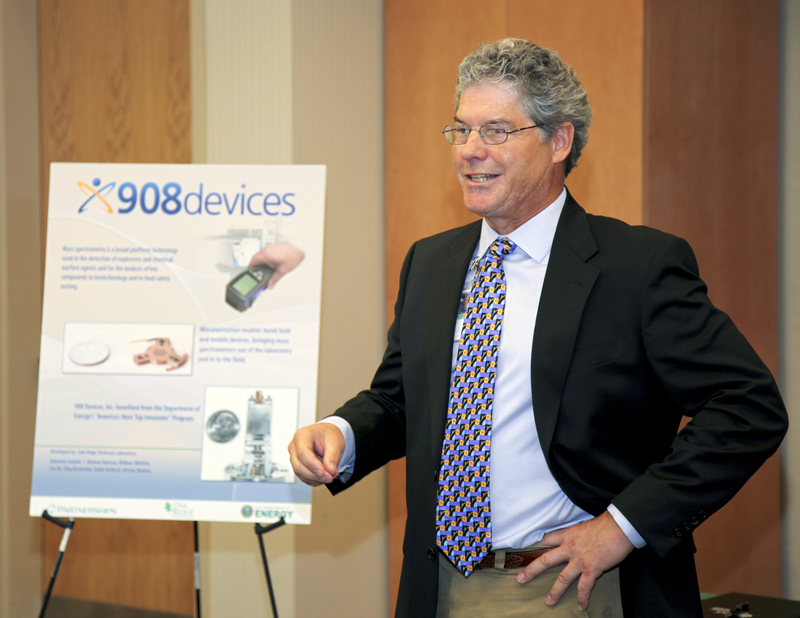 908 Devices products based on the ORNL technology have demonstrated important public safety benefits in law enforcement and hazardous materials detection. 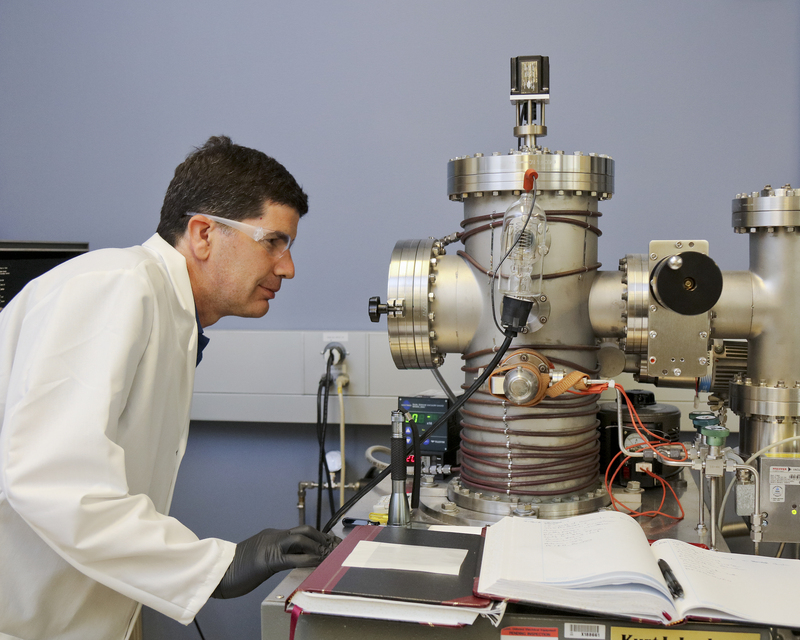 The ORNL technology consists of a highly miniaturized implementation of an ion trap mass analyzer 10 times smaller than conventional scale ion traps. Despite its small size, the device offers the same resolving power as conventional-scale ion trap mass analyzers. The device is also extremely portable. Products that utilize this technology are found in a range of 908 Devices instruments used in more than 18 countries. In addition, 908 Devices is working with the U.S. Army's Next Generation Chemical Detector program to develop devices to detect and identify chemical warfare agents, toxic chemicals and other hazards. The Miniature Ion Trap Mass Analyzer was developed by Michael Ramsey, formerly of ORNL, William Whitten of ORNL, and Kevin Knopp and Christopher Brown, co-founders of 908 Devices. Also named on the award were Jennifer Caldwell, Edna Gergel and Jud Hightower of ORNL. ORNL is managed by UT-Battelle for DOE's Office of Science. DOE's Office of Science is the single largest supporter of basic research in the physical sciences in the United States, and is working to address some of the most pressing challenges of our time. For more information, please visit science.energy.gov. Caption1: Oak Ridge National Laboratory's Open Port Sampling Interfaces for Mass Spectrometry, invented by Gary Van Berkel (left) and Vilmos Kertesz, features simplicity and elegance. Caption 2: The Superhydrophobic Transparent Glass Thin Film Innovation, invented by a team led by Tolga Aytug, provides glass displays that are extremely water repellant, durable and fingerprint-proof for products such as smart phones and tablets, solar panels, optical components and windows. Caption 3: Mike Ramsey, a former researcher at Oak Ridge National Laboratory and co-inventor of the Miniature Ion Trap Mass Analyzer, visited the lab in 2012 to participate in the license signing ceremony with 908 Devices. NOTE TO EDITORS: You may read other press releases from Oak Ridge National Laboratory or learn more about the lab at http://www.ornl.gov/news.